Lesson 8 - The Chip's Challenge Wiki - The Chip's Challenge Database that anyone can edit! 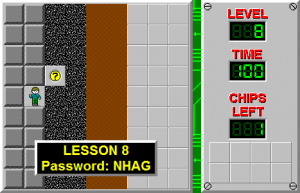 Lesson 8 is the eighth level in Chip's Challenge 1, and the final lesson level. This lesson level teaches Chip about teeth, gravel and how it is different from dirt, and the combination of the three. Because it contains only one teeth and is easy to use, Lesson 8 is an ideal level for beginners to practice monster dodging and odd and even step counting. To complete Lesson 8 in the absolute fastest way, worth 96.8, start in odd step, then move 4R U or 4R D and run east to the chip and the exit. In even step, wait  at the start. 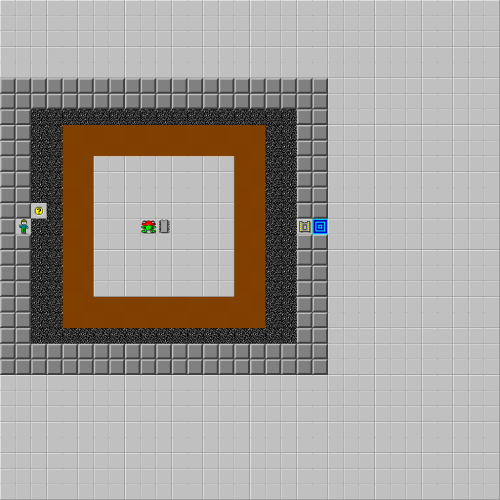 While 96 is the physical maximum time, a score of 97 has been reported; this is only possible from the Long First Second Glitch, as the Time Dilation Glitch would have no effect here. According to the most recent version of the Chip's Challenge scoreboards, Lesson 8 has had 91 reports of 96, which is the most-confirmed CC1 bold of all time.